Perched on the head of a Moche man, a condor looks unto the world filled with curiosity. 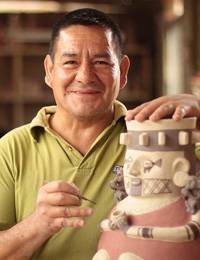 Walter Jose Acosta crafts a vivid ceramic sculpture following the artistic customs of the Moche people. They revered natural aesthetics and believed the condor to be the expression of a powerful deity.